If our reader Cate hadn’t mentioned it in a comment I would never have thought of writing about Menengai Crater. It is one of the rift volcanoes in western central Kenya, within the wonderful and strange landscape of the Kenyan Rift valley. It is promoted now to entice tourists to come but seems still an insider’s tip for a holiday off the beaten path. Menengai Crater, with an altitude of 2278 m, is said to be the sixth largest “crater” in the world but, actually, it is a caldera. 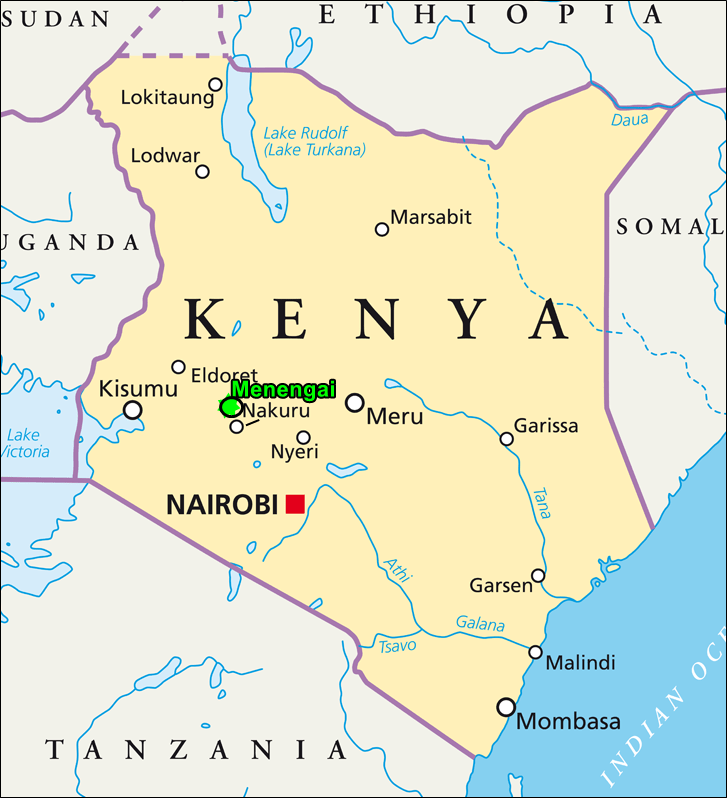 It is located a few km south of the equator, just 10 km N of Nakuru city, in the inner trough of the Kenya Rift Valley. People often say Menengai is an extinct volcano but, no – it is considered a dormant active volcano. It has erupted less than ten thousand years ago, and there are signs of some life: Small cinder cones on the caldera floor show unexpectedly hot fumarole activity. The caldera has a diameter of 12 km. From the rim, which can be reached easily on foot, the slope plunges up to 500 m down to the vast crater floor, a nature reserve today. The name Menengai (in Maa: “[place of the] corpses”) was coined after a bloody battle between two Maasai clans in 1854, during which hundreds of defeated attackers fell (or were thrown) over the caldera rim to death. Many locals believe that those poor souls are still haunting the place. 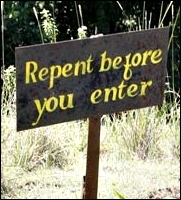 Despite such sinister stories, others feel a special closeness to God in the caldera. Pilgrims from all over the country come to pray at the volcano for hours, sometimes staying for days or months in old crater ducts or lava tubes (now “caves”). Topography and major active faults (black lines) in the East African Rift. The East African Rift System (EARS) extends for some 3500 km N-S, from the southern end of the Red Sea through to the Indian Ocean off Mozambique. It’s creation began 35 ma by rifting of the then single African tectonic plate into two major plates – the Somalia and the Nubia Plate. From the Afar Triple Junction at the Red Sea, the EARS runs south in two large branches, Eastern and Western. It is thought that these rifts are generally following old sutures between ancient continental masses that collided billions of years ago to form the African craton. They are centered on a mantle plume represented by the Kenya domal uplift, which is elliptical in plan and about 1000 km wide. 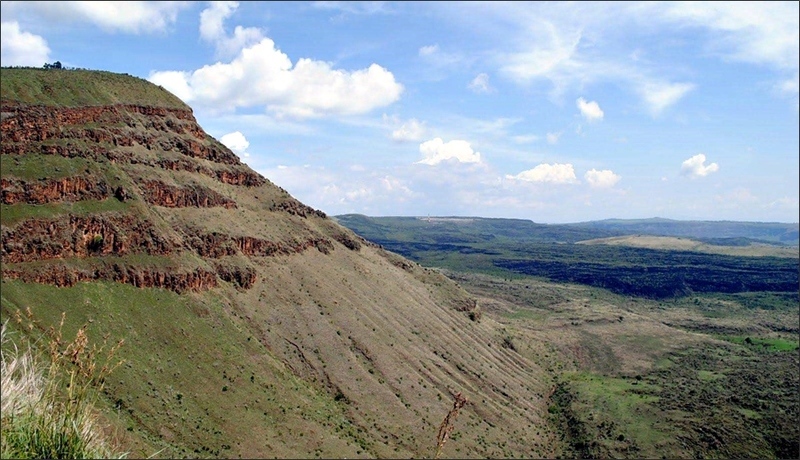 Menengai Crater sits in the part called Eastern Rift Valley (or Gregory Rift) which includes the Main Ethiopian Rift and, farther south, the Kenyan Rift Valley. The Kenya Rift again splits into splays towards north and south. Domal uplift and extension causes the brittle crust to fracture into countless small normal faults which create the classic horst and graben structure of rift valleys. 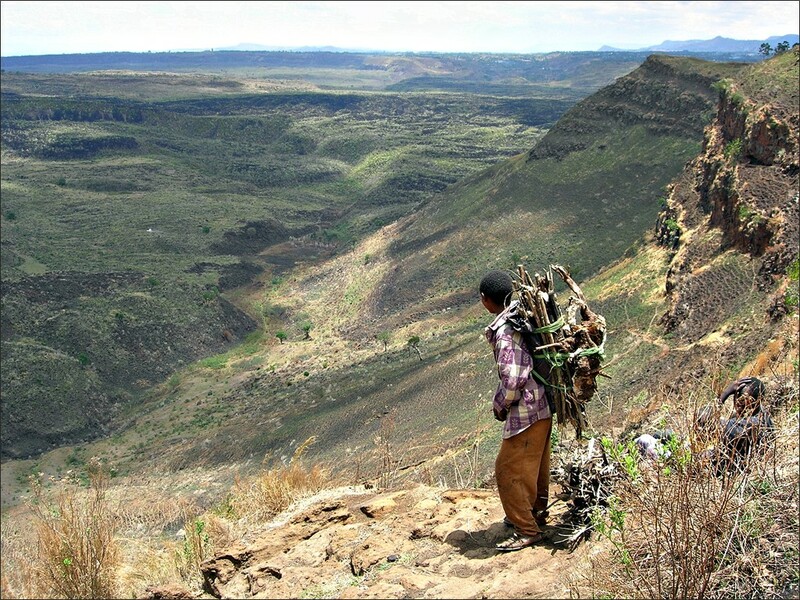 The Kenyan Rift Valley includes a number of active as well as dormant volcanoes. A 2009 study with InSAR images detected signs of activity in only four of the 11 volcanoes in the area – Suswa, Menengai, Longonot and Paka – all within the borders of Kenya. Geophysical data support the concept that a diapir is situated below parts of the rift system. This agrees with the presence below the Kenya rift of a low density body of 3.15 g/cm³ and P wave velocity of 7.5 km/s at 20-60 km depth. It has a lateral extent of 200-250 km. This also confirms seismic results indicating that the crust below the rift is stretched to a thickness of only <15 to 20 km (from a normal 36 km for surrounding East Africa) and has an anomalously low sub-Moho velocity. All this rifting, thinning of the crust and faulting provides the pathways for volcanic activity, particularly so where faults intersect. At Menengai, two rift floor tectono-volcanic axes (TVA), Molo and Solai, are important in controlling the geothermal system. There is an approximately N-S line of vents outside and to the S of the Menengai caldera. This line is parallel to the regional fault trend in this part of the Rift. The vents were probably fed by a N-S trending dyke. 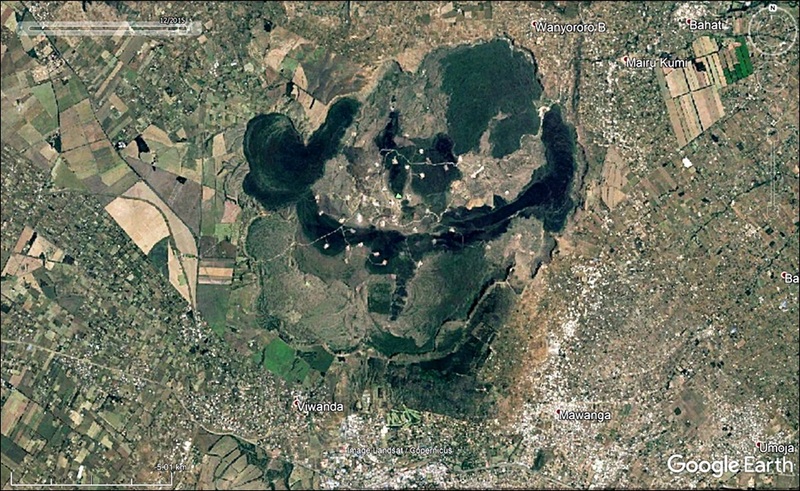 Menengai Caldera in Google Earth. The city of Nakuru begins in the S.. Light patches on the caldera floor are geothermal well drilling sites. Menengai as a volcano is a rather inconspicuous feature, consisting mainly of its prominent caldera and many lava flows inside and out. It has an almost rectangular shape, measures 12 x 8 km (77 km², 2 272 m a.s.l.) and was formed about 8000 years ago. 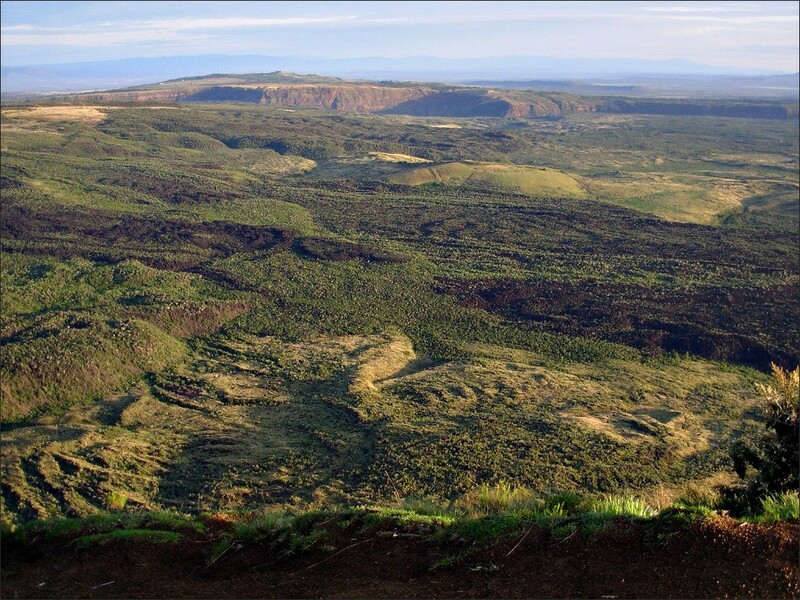 The bottom of the caldera is covered by over 70 successive lava flows. Some of them may not be much older than 100 years or so. The volcano started out as a low shield volcano, ~180 000 years ago. Research on the deposits determined two voluminous ash-flow tuffs, each preceded by major pumice falls. The first took place about 29,000 years ago and produced a large ancient caldera. The present caldera forming occurred about 8000 years ago. The associated eruptions produced about 30 km³ lava, or at least this was about the volume of the resulting present-day summit caldera. 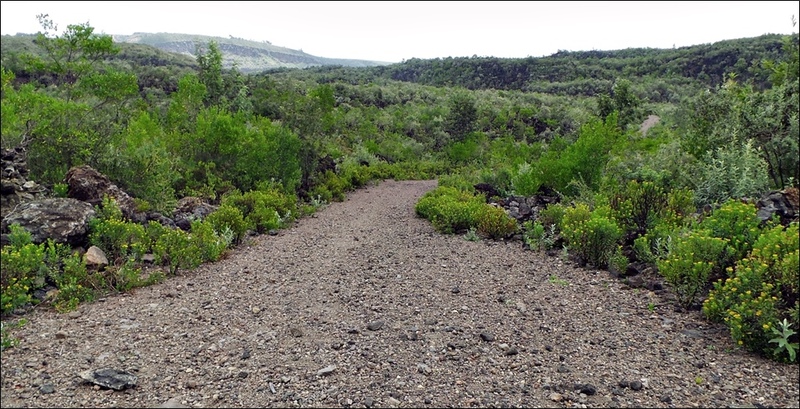 During post-caldera times, some 25 km³ of magma was erupted, mostly as lava flows which now cover the caldera floor, but also as cinder cones and plinian type tephra sheets. Menengai is considered one of the best preserved Krakatau-style calderas worldwide. This usually means (a) formation by eruption of large volumes of differentiated magma, and (b) piecemeal or chaotic collapse of the cauldron block (lid). Both these features are shown in Menengai. The theory of a sudden, large-scale eruption, though, has lately been disputed: some scientists think the magma could have been drained out very slowly and caused the caldera floor to sag as it went. 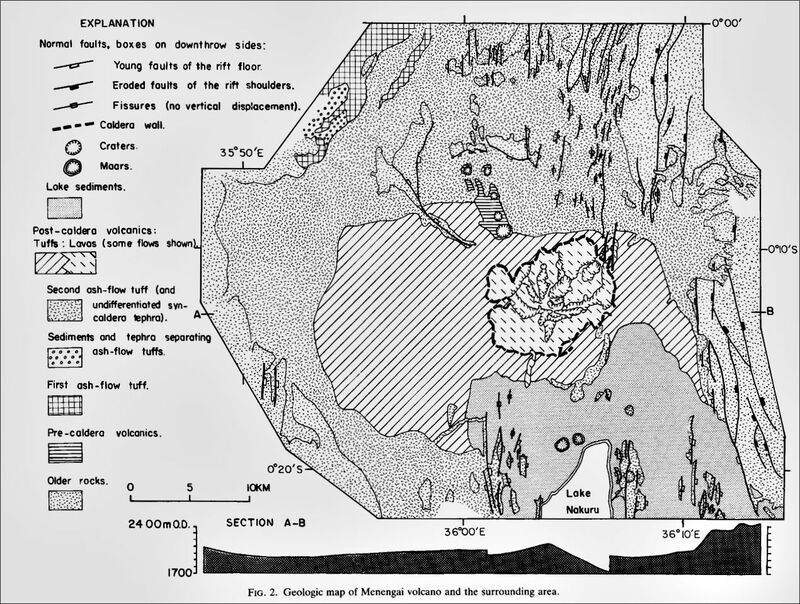 The caldera is complex in outline, suggesting that there were different periods of collapse for each part. The south and the western part of the crater are intact. 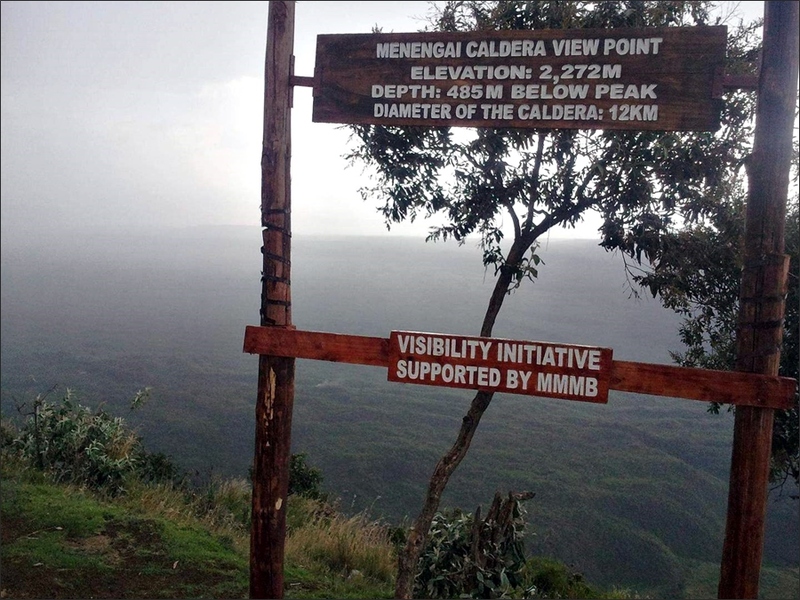 In other places, the topography of the Menengai Caldera is thought to have changed even after its collapse. Oversteepened caldera walls broke down and so increased the diameter during late post-caldera eruptions. 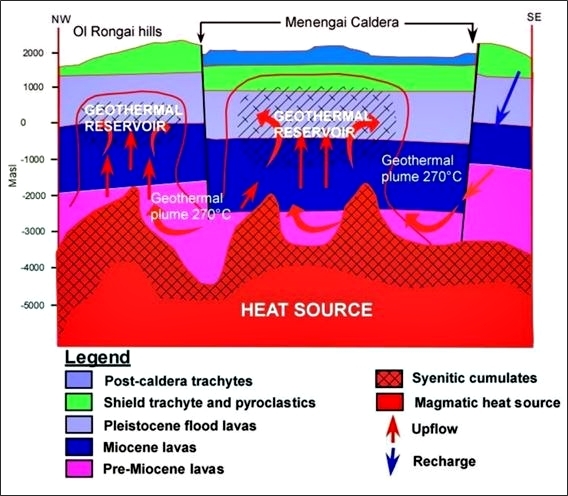 Geologic map of Menengai volcano and the surrounding area. (From: Leat et al., 1984) Click! The caldera floor is a mess of dense lava flows, boulders and inaccessible ridges. Lavas fill much of the caldera and push up against the inside of the rim. Products of many post-caldera eruptions are separated by soil horizons. Most lavas were erupted from one of a group of closely spaced vents near the centre of the caldera. These flowed radially away from the vents and have built a baby trachyte shield volcano within the caldera. This is now called the Menengai summit. Other vents are situated close to the caldera wall. Here the rising magma probably exploited the ring fracture of the caldera. As I said above, magma is generally rising below the Kenyan Rift which has been proven by InSAR measurements. During the probe drillings for hydrothermal fluids the engineers must not have expected, though, just how near the magma is to the surface – the well MW-12 actually did encounter hot magma at ~3 km depth. The previous paragraph is from Helen Robinson’s blogs (links below), a lively description in diary form of the field work she has done in 2014 and 15 in Menengai Crater. Great reading! Helen and her colleagues have surveyed the caldera floor and have found many open extensional fractures in the centre. 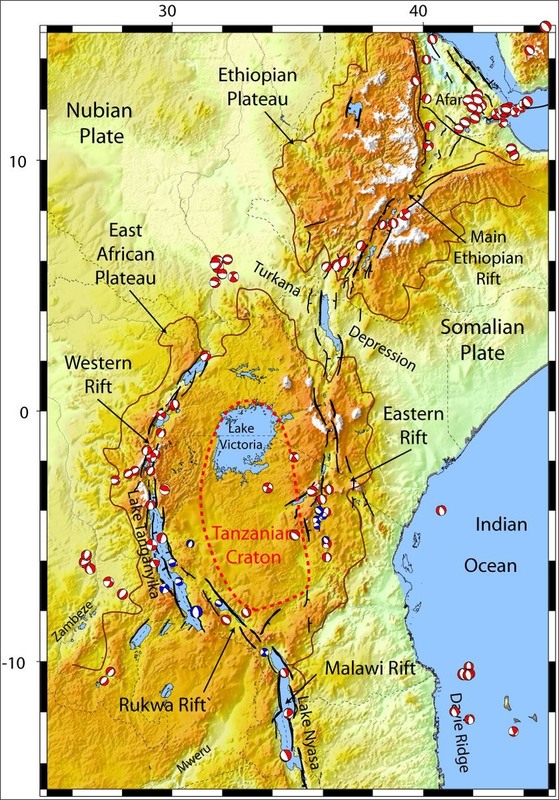 These findings may help to establish whether, as seen in parts of north-east Ethiopia and northern Tanzania, the extension in this region is now caused by dyke intrusions, or if it is still a feature of continuous rifting. There is very little tephra accumulated in the caldera, suggesting that post-caldera activity consisted mainly of effusive eruptions. 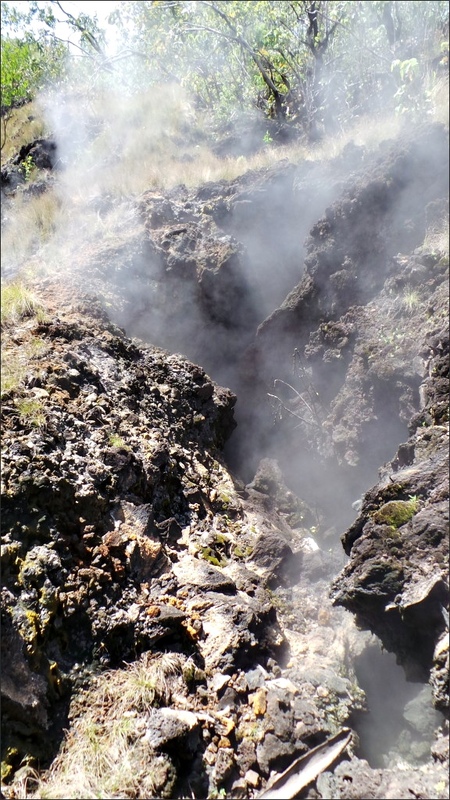 Many fumaroles are found randomly distributed in the caldera. Also, two maars are located south of the Menengai caldera and north-west of Lake Nakuru. This could mean that the magma was injected under Menengai along a north-south fault to produce an eruption in 7350 BC; however, it is not proven that the maars are related to the Menengai system at all. Menengai has developed within a unique petrographic province, together with at least four other Quaternary to Recent volcanic complexes (Eburru, SW Naivasha, Longonot and Suswa). These are all major trachytic caldera volcanoes in the central Kenya Rift Valley. The adjacent complexes may be less than 10 km apart, but petrographic and chemical analyses show that all five are derived from separate magma chambers. The Menengai volcano is composed almost entirely of compositionally zoned and strongly peralkaline, silica-oversaturated trachytes. No mafic or intermediate lavas have been identified. The volcano has had a complex geochemical evolution, resulting from the interplay of magma mixing, crystal fractionation and various liquid state differentiation processes. Drilling sites for geothermal heat are dotting the SW of the caldera floor. On at least three of them construction of electricity generators was already beginning in 2015. This is to become the largest energy generating project in Kenya (and perhaps all Africa) in the 2020s. 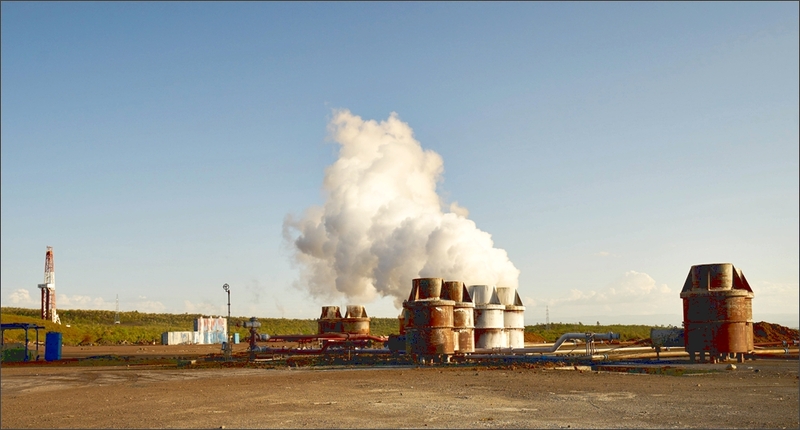 Kenya was one of the first countries to engage in the development of geothermal energy production technology. 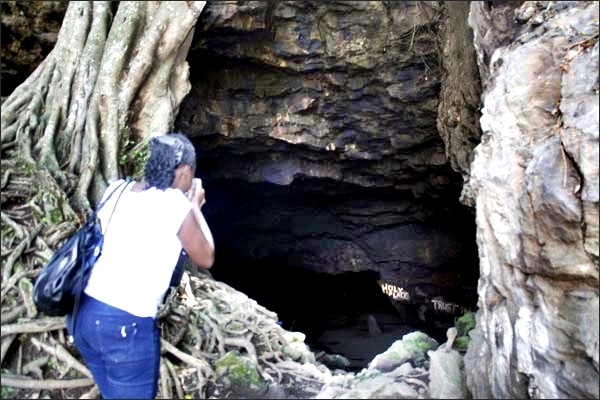 According to experts, the Menengai area is suitable for a series of projects that would make it one of the world’s largest producers of geothermal energy. Geothermal drilling in Menengai field started in February 2011. The probe drillings yielded higher temperatures than expected: 260°C – 340°C. Temperatures that high are rarely found in geothermal wells. Experts estimate that the site alone can hold a capacity of 1 600 MW, which is about 300 megawatts more than energy consumption in Kenya. By 2015 at least three independent power producers had moved to the site and begun building plants capable of generating the first 105 MW. 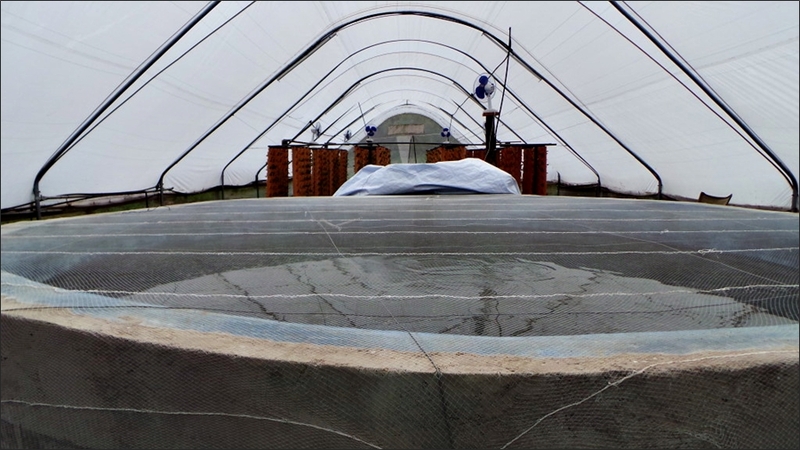 However, other innovative ideas are being explored too: A trial direct use project utilized the heat from the geothermal system to warm two greenhouses. In one there is a large tank with 3000 catfish. > Catfish waste is rich in ammonia that is regularly filtered out of the water and diluted for the purpose of watering bean plants. > The beans are very rich in nitrogen which is extracted and diluted with water to feed strawberry plants. = Using this method for strawberry growing has resulted in 2 kg of strawberries from one plant! Panoramic from the top of the view-point, eruption centre towards the middle. The source of the young lavas can be seen clearly from this point, a cinder cone situated central to the caldera. (© Helen Robinson). The light structures are a drill pad plus road leading to it, of which there are tens now in the caldera. From 1997-2000 they discovered that the volcanoes at Suswa and Menengai subsided 2-5 cm, and between 2004 and 2006 the Longonot volcano experienced uplift of ~9 cm. However, the most dramatic uplift was seen at Paka (125 km N of Menengai), which had uplift of ~21 cm during a nine month period in 2006-2007. This pulse of activity was preceded by transient uplift and subsidence at a second source, associated with the magma flow through the complex underground plumbing system. Which means that discrete pulses of magma were arriving at the crust, similar to a stop valve that is being turned on and off intermittently. The fact that these areas are so close to a major metropolitan area pose a challenge in terms of a large volcanic or seismic event. Suswa, Menengai and Longonot are all located in densely populated areas within 100 km of Nairoibi. Menengai does not show any volcanic activity presently, so, fear not. But even should it ever erupt, there may not be anything greatly explosive in it. Given its post-caldera history of lava flows and strombolian outbreaks, there is no reason to expect a different style now. Even the new considerations of the caldera-forming events point to slow lava effusion instead of sudden explosive eruptions. Probably the most affected area would be the caldera floor, and, with that of course, a field of very productive geothermal power stations. I wish everyone a very happy and prosperous 2018! Explosive caldera forming VEI6/VEI7 eruptions usually occur in subduction zones. You wouldn’t expect this in rift valleys at all. But magma fractionalisation/magma differentiation inside magma chambers in continental crust does the trick. The Kadovar Volcano of P.N.G. 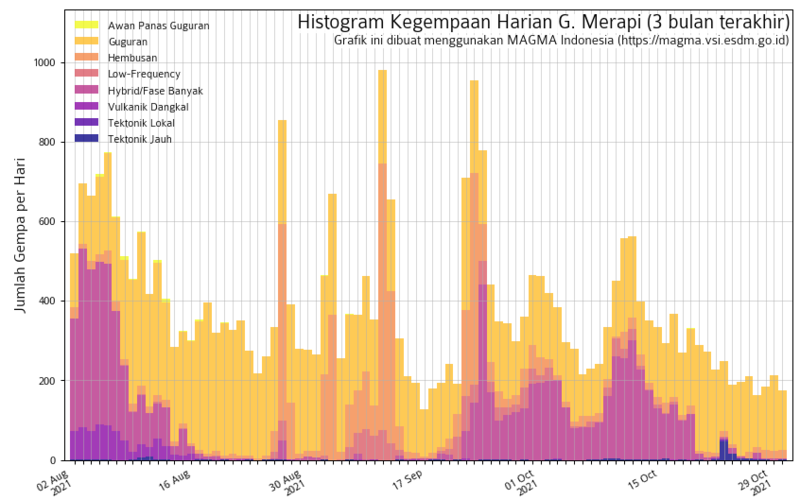 has begun an eruption yesterday. Apparently all 700 inhabitants have evacuated safely. The volcano is some 50 km NW of Manam volcano, off the N shore of East Sepik Province. It has not had a confirmed eruption in recorded history. Last reports were from 1976-81, when hot ground, increased fumarole activity and sea water discolorations were observed. Wonder if this is “just” a wildfire near Rabaul? Must be huge… If it were the volcanoes we would have heard, wouldn’t we? 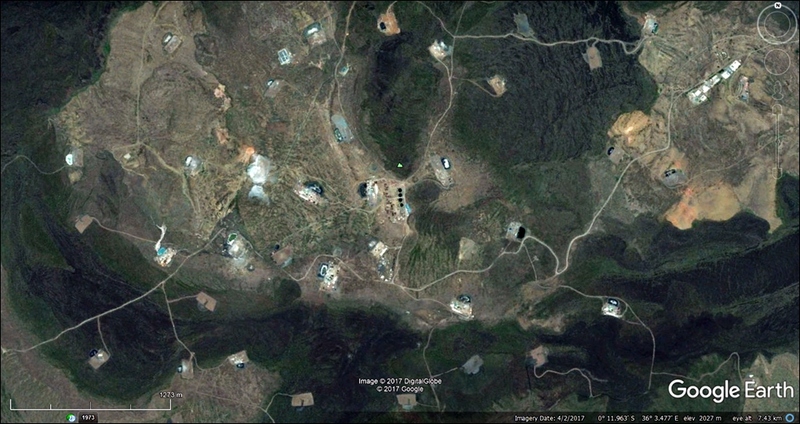 (on MIROVA: http://www.mirovaweb.it/?action=volcanoDetails&volcano_id=252140) I’ve found nothing on other satellite imagery so far. interesting.. must be volcanic though as I don’t think anything is growing there yet that could catch fire. Yes, thought so, too. I am becoming convinced now that this is an error of some sort. There is nothing on the very clear Aqua/Terra Modis imagery today, nothing on Suomi NPP/VIIRS (Fires & Thermal Anomalies), and nothing that I can tell on Himawari. Perhaps the unvegetated black surface is becoming so hot from the sun that it can be detected by instruments? It’s been early afternoon there today and yesterday. There also seem to have been 12 similar occurences over the past year.